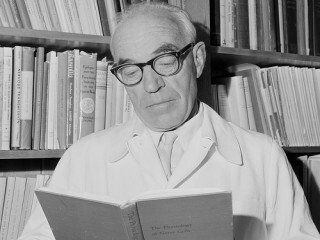 John Carew Eccles was an Australian neurophysiologist who won the 1963 Nobel Prize in Physiology or Medicine for his work on the synapse. He shared the prize with Andrew Huxley and Alan Lloyd Hodgkin. In the early 1950s, Eccles and his colleagues performed the research that would win Eccles the Nobel Prize. To study synapses in the peripheral nervous system, Eccles and colleagues used the stretch reflex as a model. This reflex is easily studied because it consists of only two neurons: a sensory neuron (the muscle spindle fiber) and the motor neuron. The sensory neuron synapses onto the motor neuron in the spinal cord. When Eccles passed a current into the sensory neuron in the quadriceps, the motor neuron innervating the quadriceps produced a small excitatory postsynaptic potential (EPSP). When he passed the same current through the hamstring, the opposing muscle to the quadriceps, he saw an inhibitory postsynaptic potential (IPSP) in the quadriceps motor neuron. Although a single EPSP was not enough to fire an action potential in the motor neuron, the sum of several EPSPs from multiple sensory neurons synapsing onto the motor neuron could cause the motor neuron to fire, thus contracting the quadriceps. On the other hand, IPSPs could subtract from this sum of EPSPs, preventing the motor neuron from firing. Apart from these seminal experiments, Eccles was key to a number of important developments in neuroscience. Until around 1949, Eccles believed that synaptic transmission was primarily electrical rather than chemical. Although he was wrong in this hypothesis, his arguments led him and others to perform some of the experiments which proved chemical synaptic transmission. Bernard Katz and Eccles worked together on some of the experiments which elucidated the role of acetylcholine as a neurotransmitter. In 1990 he was appointed a Companion of the Order of Australia (AC) in recognition of service to science, particularly in the field of neurophysiology. He died in 1997 in Locarno, Switzerland. Eccles was a devout theist and a sometime Roman Catholic, and is regarded by many Christians as an exemplar of the successful melding of a life of science with one of faith. A biography states that, "although not always a practicing Catholic, Eccles was a theist and a spiritual person, and he believed 'that there is a Divine Providence operating over and above the materialistic happenings of biological evolution'..."
View the full website biography of John Eccles.